Breast Cancer? But Doctor....I hate pink! 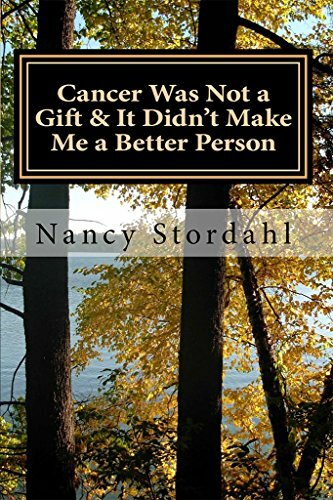 : Book Review: Cancer was not a Gift. My friend Marty. A question. Book Review: Cancer was not a Gift. My friend Marty. A question. I confess to having wondered why people hang on to cancer when they have been through treatment and have the ability to put it behind them. This isn't meant to be a mean or insensitive thought; it's more along the lines of wishful thinking. I so wish I could have been given the ability to put it in the past; to be the person whose last chemo was 6 years ago rather than last week and to not even think about it. I like to think that if my own bout of cancer had ended when it should have -when I was done with my mastectomy, chemo, herceptin - (by now I'd even be done with my tamoxifen) - well, I'd hope that I would not be thinking of it except as a distant memory. Of course, I know better. That never happens. It is always with you. I understand that a brush with cancer can cause a form of PTSD and can be present years after medical therapy is over. Some think about it daily and some only once in a while, but the truth is, once cancer touches your life, it is there forever. Your friends and family forget - but you don't. The fear lasts, the experience lasts, and in some cases, side effects even last. For some, cancer is a silent ghost, forever in the corners of their lives, appearing unexpectedly at the turn of a head, a minor ache or pain, years after they have physically recovered. Nancy Stordhal is one of these people, not only because of her own experience, but because her mother died two years before the disease became hers. Nancy knows better than most that cancer is not just a curable cell mutation - it becomes part of you. Her cancer story, and her mother's, is told in her memoir, "Cancer Was Not a Gift & It Didn't Make Me a Better Person." Her clever title already belies the storyline that we are all familiar with - that cancer changes us for the better, makes us better, more thoughtful people, and has something to give us. When it takes your mother, and tries to take you, that is impossible to believe. Her book explains exactly why there are no pink bows attached to this diagnosis, and why the myth about cancer being the ultimate teacher of positivity is a mere marketing tool, and why it's so alienating to most of us. While not giving away details, the story switches between Nancy's unexpected diagnosis two years after her mother's death and her mother's struggle. She looks back on and describes her mother's experiences as she faces her own diagnosis, treatment, and recovery. It is a family tragedy, words unsaid, situations only realized after the fact. The fear and sadness cancer causes is the star of this book, not empty words and false smiles people believe they must put on. There are no ultimate whisperings to love your life, appreciate your minutes - just sadness and regret and anger. But isn't that what this disease is about when a loved one dies? Cancer causes suffering. It causes heartbreak, and pain. This book illustrates these emotions with unflinching honesty. Not that it is all depressing. but the point is that one does not have to pretend to be happy in the face of misery. Nancy expresses what most of us feel and which society dismisses. The only story people hear is the happy one. If you are the type of person who wants to read about the reality of cancer, this book is for you. No, it's not graphic, but you will read about a daughter taking care of a mother during her last days - then facing the possibility of having those same last days. It is absolutely heart-wrenching. Nancy's experience will show you exactly why this isn't a disease that is easily dismissed, and why one may be dwelling on it years after treatment. The book is well-written, clear and uncompromising. Her practical style shows through, as does her thoughtfulness. While the subject matter is depressing, she is not depressed. She has support, but she is honest that this is not a pleasant experience. Whether you have cancer, your relative does, or you just want to read about this disease, this book is of interest. You will learn that we are human, we do not have to love our cancer experiences despite what society says, and that is a message that is worth internalizing. Nancy also has a facebook page, and a blog. She has written a book about dealing with chemo and a mastectomy too, both practical books, that I recommend for the newly diagnosed. I contacted Nancy and she has generously offered to give away her book, so anybody who comments below is entered to win to win! Please make sure to check back so that I can make sure the book can get to you. For nearly 20 years, I have been a member of a group of people who post online. We all started out discussing an electronic piece of equipment and now are just friends, who have met, gone on trips, and a few have married! We have gone through divorces, a few deaths - and cancer. One of them is a friend named Marty, a man who has never, to my knowledge, said a bad word about a soul. He has pancreatic with a short life expectancy. He has a travel dream, and while I normally do not post these funding things because many of them turn out to be fake, this is a person I know, care about and I want him to go. He has never been a wealthy person and can use the help. 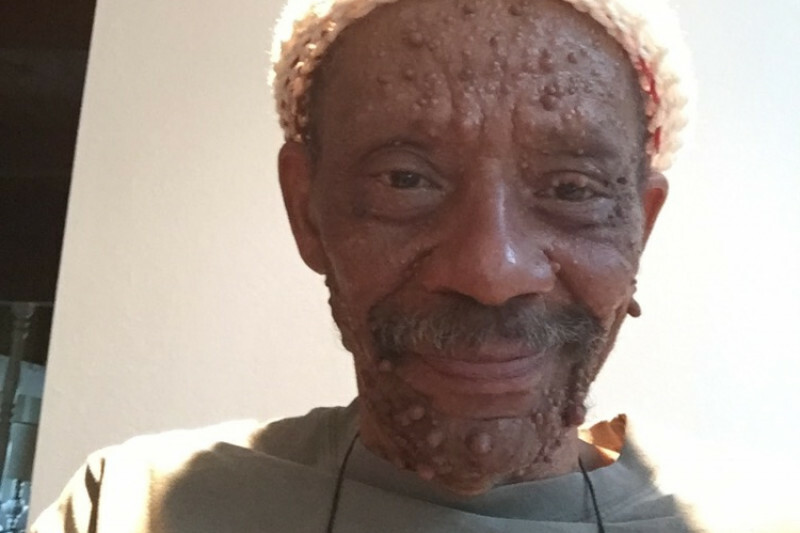 If anybody can donate even $5.00 to him, I personally would be very grateful. I know Marty would as well. When he showed me his GoFundMe, I said in astonishment, "You have the energy to travel that far?" and he responded, "It doesn't matter, I want to go, it's been my dream and I AM going." Please make that happen for Marty. Me own .....ideas? and Thanks. Finally I thank all of you who uses my Amazon search box to the right to make your purchases. This affiliate like really helps me. I usually get 20 or so on Amazon so I can purchase something I want or safe it until Christmas. Please keep using it - just go to the right of my page and search there for your purchase. Anything you buy in that session will give a small amount to me. Please don't think negatively of me, but I am thinking of starting a Patreon to make a little money here and there - what do you think of that? By now, this blog is the size of five books and I think a little money would encourage me to keep it up. Or obligate me! :) I want to keep the content free, of course! To use Patreon, I have to come up with awards, and suggestions for those would be great! (Typically, people do behind the scenes things, like chats or something, but most are YouTubers. I can be flexible!) Not that I'm broke, but I have not worked for a long time, I still have a child in college (one year left!) everything is going up in CA (water bill - from 15.00 to 80.00!, and of course, insurance which went from 0 to 5k. I have tried to make things to sell ....you all know now that goes. The pens were not cost effective, not to mention that I get sick too often and can't be consistent. So please let me know if a Patreon is too cheesy or undignified and you would think negatively of me for doing it. (It would be voluntary, of course). I have also considered writing an book like Nancy has done, but again, it is difficult for me to do things day to day and Nancy has the market cornered! I had a publisher who was going to turn my blog into a book but she flaked and frankly, I never wanted it to be a book anyway. So if anybody has money ideas, aside from Patreon, let me know! I am intrigued by this book Ann as I am a two-time survivor and always worked at downplaying the crud of cancer except with one of my best friends. This week she died at 64 of lymphoma. The sadness is overwhelming. Meanwhile my husband has metastatic prostate cancer and bladder cancer most probably caused by the prostate treatment. I lost my brother at 57 to lung cancer. This disease nontinues to invade our lives and stripped us of peace. So I would love to hear Nancy's thoughts. I have been following you for years and thank you for your humor and honesty. P.S. I'm sorry but I don't know what a Patreon is! My goodness, you've been hit big time. How terrible, I'm so sorry. This must be so hard on you. *hugs*. Patreon is fine, but don't expect much from it. I give to two well-known people who give a monthly exclusive newsletter, but each gets only about $1000 per month out of it. And don't promise much: an extra couple of paragraphs a month to your supporters should either get them to support or not. Thank you for the book review. I'm intrigued for so many reasons: as a cancer survivor, as the daughter of a cancer survivor, and as someone who helped her friend die from this terrible disease. BTW - It's good to hear from you. Hugs. I'm so sorry there is so much cancer in your life. Ann, I am a fan of yours *and* a fan of Nancy's. I'm so happy to see you review her book. "The point is that one does not have to pretend to be happy in the face of misery"--this. So much this. During my cancer process, I've been told too many times to "be positive". Reading Nancy's perspective and your perspective has helped keep me sane, and made me feel less alone. Yes, nobody can just "be positive". One. An have a strong attitude and one. An cry and both are valid. We go through both during this disease but nobody should tell anybody how to feel. People, just listen and let us express ourselves. We may feel like we'll beat it and we may feel like we won't. Neither thought affects the outcome. And both are natural feelings to have. I remember so well when your 'punchline' was "cancer made me beautiful" and I'm sure that so many of us can laugh now at this. But that is a private joke, we are no "cancer survivors". We may have surpassed certain dates or deadlines, but if we are still here, then go shout it, celebrate it. I live my life, no misery, only the day that will arrive after this day is done. It is there, it will always be there, but I will not submit to it, not yet. I'm sorry I didn't reply until now. You are clearly quite bright for a 13 year old. I'd be happy to take a photo if we ever met. I can't wait to read this book (I hope i win a copy, but will go out and buy it if I don't). My mother was diagnosed with stage 4 breast cancer 5 months ago. It seemed as if every place they looked, they found more cancer. The final blow was that she had lesions on her brain. Also, the cancer on her spine was minutes away from severing said spine and paralyzing her completely. Here we are 5 months post diagnosis and my mother has gone back to work full time. She is an LMSW and works as a therapist at a low income clinic for children, most of whom are undocumented and only speak Spanish. She is back to driving her 6 speed, manual transmission sports car. She has refused pain killers although they've tried to give her tons. She has lost all her hair from full brain radiation and they tell us it will never grow back. Statistics tell us that she has 2 years at the very most, but on the other hand, doctors have been utterly shocked by how well she's been doing, considering that she has cancer everywhere. When they initially found the cancer, they couldn't believe she was still up and walking around, much less working and driving and taking only Advil for the pain. All in all, the cancer had spread from her right breast to her bones, lymph nodes, brain, pelvis, hips, leg bones, and ribs. She carries a whole lot of guilt for not going to the doctor sooner and, while I do not feel any anger toward her for this, my older sister is very angry. Anywho, I have been reading your blog pretty much since the day she was diagnosed. My mother and I are atheists and my mother isnt into pink/syrupy stuff. She is a realist. So, when I googled things that may help, your blog popped up! I'm still having a hard time getting her to read any blogs or go to any support groups. The scariest part for me (other than the thought of her death) is the very real possibility that she will experience dementia down the line as a result of the brain radiation. My mom is sharp and the possibility that she could lose her mind takes my breath away. I'm crying as I type this. Anyway, she will be turning 70 on May 18th and, as unlikely as it may be, I hope I can share more birthdays with her. 3 months ago her scans showed that the Herceptin and radiation had completely obliterated many of her tumors. We go back for more scans 3 days before her birthday (on May 15th), to see if treatment is still working. We live in Austin, Texas and she is being treated at MD Anderson on Houston, which is suppose is a bit of a silver lining. Thanks for listening! Sorry that this comment was all over the place. Whoops,meant to type: all in all the cancer has spread from her right breast to her spine (both the vertebrae and the marrow), clavicle, ribs, pelvis, hips, leg bones, and brain. I'm so sorry about your mom. Please let her know that nothing she did caused this. It's not her fault and she should never feel guilty. Dinosaurs died of cancer, and it was found in Egyptian mummies. And cancer comes back no matter how early it was diagnosed. Totally not preventable. She will handle it the best way for her, support groups aren't for everybody. She's at a good hospital at least. My best to your family. I am one of those people trying hard to forget my cancer experience 4 years ago. It is not possible. I would love to read this book. And I love to read your blog. Lydia, you won!! Please contact me on Facebook or via email so I can get your info and send the book out. 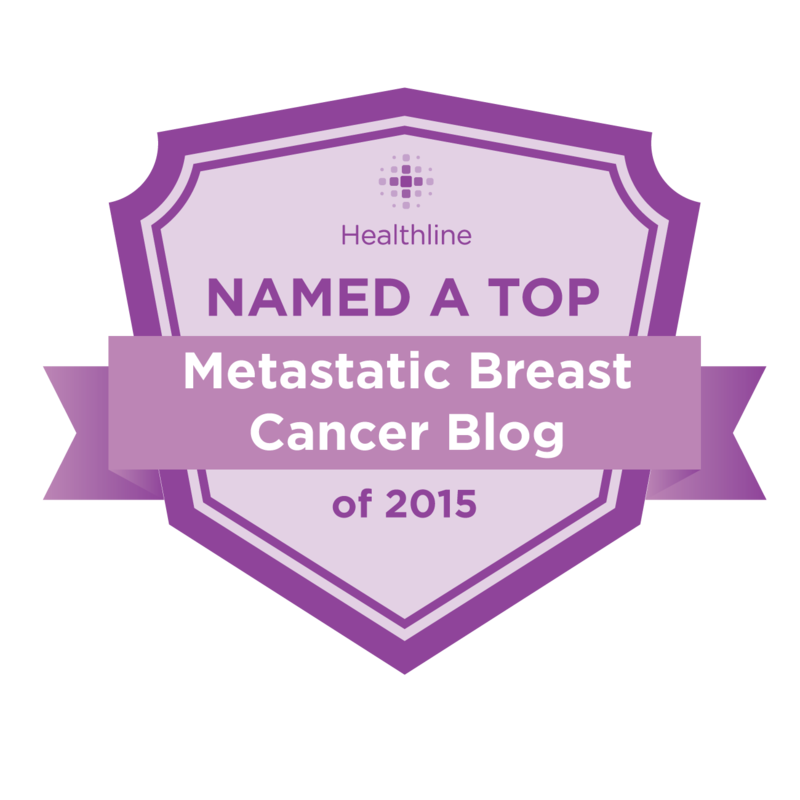 I was diagnosed with Stage IIa Breast Cancer in August 2014. My treatment is finished, but the fear of mets is always in the back of my mind. A dear friend of mine finished her treatment, finished 5 years of tamoxifen, and one year later they discovered mets in her lungs. She died a little over one year later. Even if you're not Stage IV, you can never put this disease behind you fully. By the way, I love the title of your blog. I too am weary of the constant pinkness surrounding breast cancer. I hope some of the fear fades as time goes on, but I know it's always there. My heart goes out to you. If you can make money using Patreon, sign me up!